The recent dust storms experienced in the Southern Eastern Australian states was a combination of strong winds and our drought effected lands. Unfortunately, this combination had a very serious side with Asthma and Allergy sufferers being exposed to what can be a deadly trigger. Now that the winds have subsided and the dust has literally settled, we must ask how much has settled into our homes and businesses. 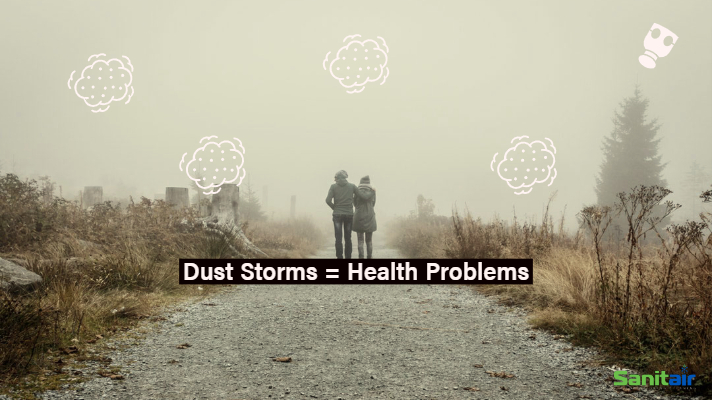 Dust storms like the ones recently experienced in Australia have the potential to effect indoor air quality months after the actual event. Affected homes and businesses need to remove the residual effects caused by these storms to restore indoor air quality. A thorough Vacuum with a HEPA vacuum not forgetting blinds curtains and bed spreads. Dusting all solid objects and cleaning our air conditioning units. Air conditioners become heavily contaminated in such events and can continue to blow airborne contaminants around until removed properly. 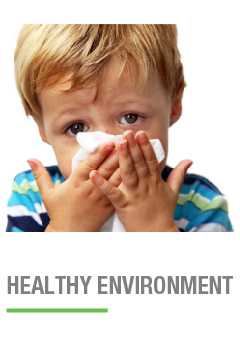 A professionally cleaned and sanitised air conditioner will not only restore your systems health but it has been proven to greatly improve indoor environments along with protecting the health of room occupants. 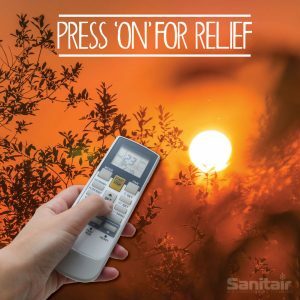 Sanitair will remove recent dust storm contamination from your air conditioners and make them Look, Smell and Run as New. Infants and children inhale and retain larger amounts of air pollution per unit of body weight than adults; in fact, the air intake of a resting infant is twice that of an adult. When studying the health effects of a particular hazard, children are often considered as if they were small adults, however, children represent the largest sub-population susceptible to the adverse health effects of air population. For example, during the first few months after birth, an infant’s metabolic pathways are still developing and due to the biochemical immaturity, an infant cannot detoxify and excrete toxins as well as adults (Tamburlini et al., 2002). It is difficult for newborn babies to regulate their body temperature, in fact its only at around 18 months to 2 years that babies really learn how to regulate their temperature naturally. Using the air conditioner can help to provide the ambient room temperature to keep your baby comfortable. Before you turn on your air con, first check to see if you air conditioner is clean and not blowing mould or bacterial contamination back in to the room for your baby to breathe in? Mould is an unsightly fungus and causes a number of negative health effects for room occupants. Usually mould is found in dark, damp areas of your home like the bathroom. We don’t think to look in the air conditioning system when looking for mould. 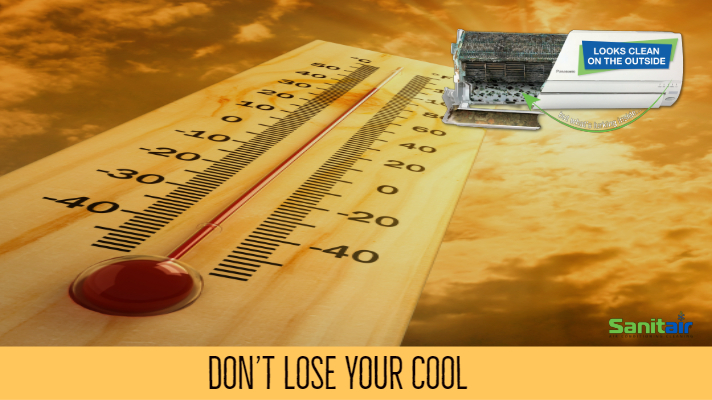 The air conditioner is always damp and it filters the indoor air which creates a build up of contaminates on the indoor coils creating a food source for bacteria and mould to thrive. Cleaning the filters will not address the mould issue, you will need to engage a professional that specialises in HVAC (Heating, Ventilation & Air Conditioning) Hygiene. Due to the air con’s ideal environment for mould to thrive, the mould can begin to grow back within as little as four weeks after having your air conditioner cleaned. Having the air conditioners professionally cleaned is a great start to ensuring the mould contamination is not blown back into the room. To ensure peace of mind an antibacterial treatment should be used on the coils to prevent mould growth for a minimum of 12 months. Sanitair guarantees 12 month mould free from treatment date and all Sanitair products are environmentally friendly, bio-degradable, asthma and allergy friendly. Sanitair Premium HVAC Hygiene remediation can remove mould, bacteria, pet dander, DNA, skin squames, faeces, pests, dust, dust mites from deep within your system where you can’t reach. Our Premium clean takes approximately 60 – 90 minutes to complete and comes with a 12 month mould free guarantee. We are located in every state and territory with over 67 branches across Australia that are locally owned and operated. 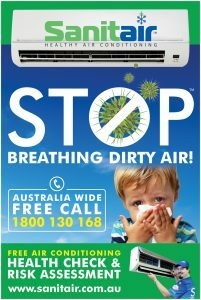 Freecall Sanitair 1800 130 168 and ensure the air in your home is clean and healthy to breathe.